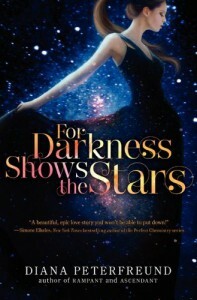 Read more of my reviews at Secrets of Lost Words.Rating: DFor Darkness Shows the Stars totally bought me with the cover. Isn't the cover gorgeous, though? Sadly, this book didn't live up to my expectations.There were things that I liked but overall the pace really slowed down the story and things would get boring. I liked the idea of how the humans develop technology to make themselves gods. That's the story of how the Reduction came about.The ending of this book was good and I was happy Elliot made a good decision in her life to fulfill her dreams. The romance was a bit baffling. One minute, Kai hates her and the next he's begging to fly away with her.. I mean, what the hell?! I do not understand this :sThe synopsis said this is inspired by Jane Austen's Persuasion. I cannot say how they're alike since I've never read Persuasion. I do like Jane Austen books though so I need to pick that one up.The bad thing about this one is that the pacing was too slow for me. I grew really bored at times (actually, most of the time) and I kept waiting for Elliot to stop blubbering about her unrequited love toward Kai. Elliot was a bit annoying because she was going on and onnn about how Kai changed and he wasn't the same and blah blah blah. Every time, something she wasn't expecting happens (breaking the law), she would run out the door and vent out her feelings. She does the exact same thing. She has broken the law before. And she's disgusted toward her childhood best friend for that? She's such a hypocrite! !Sadly, the bad points override the good ones and I'm not satisfied with this book. I will pick up the next though in hope that it turns out better.